For many of you Skipper 10’ and 11’ owners, you are probably looking for a reason to move up to a larger Skipper tender. Like many boat owners, this is a very common “itch” as they might call it. Let’s face it, you’re probably itching for a bigger boat and you want to move up in the line. Whether you’re buying an inflatable yacht tender, a flybridge convertible or a center console, the itch is always going to be there. You might as well satisfy it by looking at the next model up. Enter, the Skipper 15’ inflatable tender from Tender Care Boats. This year will be the first time Tender Care will have three Skipper models to choose from – 10’, 11’ and 15.’ All of our models are built with Tender Care’s quality craftsmanship, durability and affordability, and without compromise. The Skipper 15’ comes equipped with features that only the most discerning of yachtsmen can appreciate. 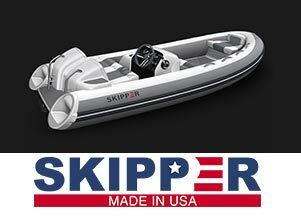 Additionally, the Skipper 15’ is representative of the growing market and has several qualities that is perfect for Skipper customers. Here are a few characteristics that will help you see why the Skipper 15’ is a great choice for your next inflatable tender. Whether you are boating in Florida, the Caribbean, New England or internationally, the Skipper 15’ will exceed your expectations everywhere you take her. Take a look at the specifications of the Skipper 15' and see for yourself why this tender could quite possibly be the best 15' tender on the market today.